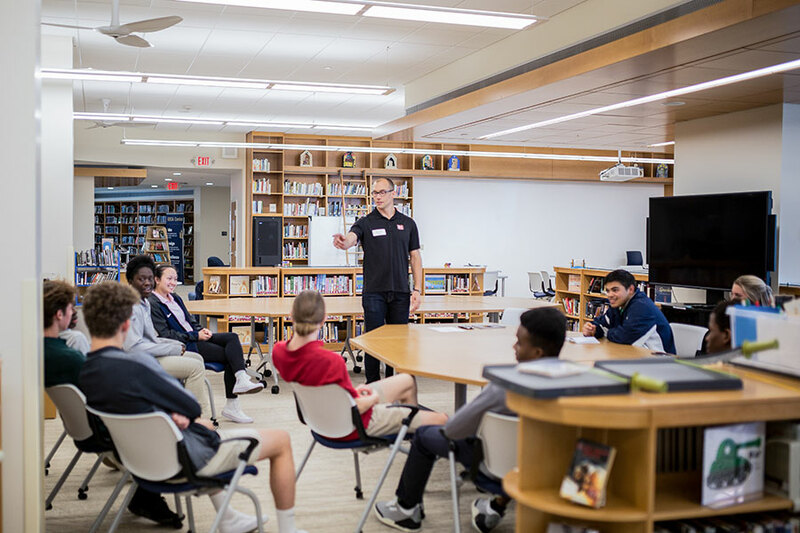 “What do you want to be when you grow up?” joked Ryan Roth, co-owner of D1, a local sports training center, at the Upper School’s first annual Career Fair. With certainty, students rattled off a range of professions, including interior decorator, educator, video game designer, and professional soccer player. Roth continued the conversation, explaining that, at their age, he was just as certain he’d have a career in football. He went on to tell about his journey from being cut by the Buffalo Bills NFL team and later hired by an arena football team in Nashville, Tennessee, to finding his niche in sports training. Throughout that journey, he said, faith, family support, and a passion for helping athletes excel played key roles in steering him toward his current career. Over the course of the afternoon-long Career Fair, organized by the Academic and Career Counseling Office, 30 panelists engaged juniors and seniors in a lively discussion of career ideas and aspirations. According to Academic and College Counselor Kelly Brown (C’00), the goal was to expose students to a wide range of professionals, including those outside the Principia community whom students had never heard from. “I’m very interested in working in the Christian Science field, so attending the workshop with a Christian Science nurse and then one with a Christian Science practitioner was super enlightening for me,” says senior Kale Ostler.